Habit: Subshrub (in California), <= 1.5 m, appearing glabrous. Stem: 1--many from base, erect or ascending, branched distally, +- striate, gummy-resinous, minutely scabrous, yellow to tan or gray; older bark generally fibrous. Leaf: alternate, sometimes in axillary clusters, entire, gland-dotted, gummy-resinous, glabrous or minutely scabrous, dark gray-green. 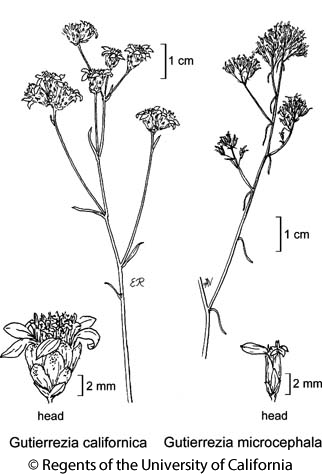 Inflorescence: heads radiate, generally many in +- open cyme-like clusters, 1 or in short-peduncled clusters at tips of inflorescence branches; involucre +- cylindric or narrowly to widely obconic; phyllaries graduated in 3--4 series, straw-colored, tips green; receptacle flat to conic, epaleate, minutely hairy. Ray Flower: 1--13; corolla yellow, ray often inconspicuous. Disk Flower: 1--13 (in California), bisexual or staminate; corolla yellow, club- or narrowly funnel-shaped, lobes short, recurved; style appendages lanceolate. Fruit: narrowly obconic, 5--8-veined, light tan, with +- white appressed hairs; pappus of 1--2 series of finely toothed, white or +- yellow scales generally 1/2 fruit length (in California) or much reduced. Species In Genus: 28 species: western North America, South America. Etymology: (Gutiérrez, surname of a noble Spanish family) Toxicity: TOXIC to livestock, fresh or dried in hay. Habit: Plant 2--10 dm. Stem: sprawling to erect, sometimes +- red. Leaf: +- linear. Inflorescence: heads 8--20-flowered, generally 1 (or in groups of 2--3) at 2° inflorescence tips; peduncle generally > 1.5 mm; involucre generally +- bell-shaped, sometimes obconic, generally <= 6.5 mm, < 3.5 mm diam; phyllaries generally 9--21 in 3 series. Ray Flower: 4--13; corolla 2.5--7.2 mm. Disk Flower: 4--13, bisexual; corolla 2.3--4.2 mm. Fruit: 1--2.8 mm. Chromosomes: 2n=16,24. Ecology: Grassland, arid woodland and shrubland, sometimes on serpentine; Elevation: < 1600 m. Bioregional Distribution: NCoRI, SnJV, CW, SCo, WTR, SnGb, PR; Distribution Outside California: northwestern Baja California. Flowering Time: Jul--Nov Note: Variable in involucre shape, arrangement of heads. Intergrades with Gutierrezia sarothrae in central and southern SCo, Baja California. Citation for this treatment: David J. Keil & Meredith A. Lane 2012, Gutierrezia californica, in Jepson Flora Project (eds.) Jepson eFlora, http://ucjeps.berkeley.edu/eflora/eflora_display.php?tid=3140, accessed on April 20, 2019. NCoRI, SnJV, CW, SCo, WTR, SnGb, PR; Markers link to CCH specimen records. Yellow markers indicate records that may provide evidence for eFlora range revision or may have georeferencing or identification issues. Purple markers indicate specimens collected from a garden, greenhouse, or other non-wild location.